The most efficient global climate policy is to price carbon. The Kyoto-Copenhagen agenda was intended to do this with a system of international cap and trade. We view these negotiations as a game in which countries choose their quantity targets based on self interest. Like the analogous public-goods game, in which countries choose their abatement levels, we find this game leads to uncooperative behavior and suggest that this is why the Kyoto approach inevitably failed. By contrast, a game in which all countries vote for a global quantity target or a global price target can lead to a highly cooperative choice of target. However, the assignment of responsibilities for a global quantity target stymies implementation of a global cap. The global-price-target game largely overcomes this barrier, because a uniform global price providesafocalpointforcooperation.Howeverlow-emission countries apparently prefer a much lower global-price than more prosperous countries unless a Green Fund is implemented. A game that couples such a fund to the global price target can largely overcome this barrier to cooperation. We describe such a game along with its equilibrium outcome, which promises to be inexpensive and cooperative. 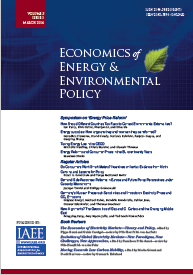 Published in Volume 1, Number 2 of The Quarterly Journal of the IAEE's Energy Economics Education Foundation.